A ‘gallery’ is a collection of photos for a specific event or subject, e.g. An ‘album’ is a way of grouping galleries with similar subjects together – ‘Competitions’ album contains all ‘competition’ galleries. You can have nested albums (albums in albums in albums). But, best to avoid that as we don’t really need it and it keeps things simpler. To upload a collection of photos to a gallery, first create a new gallery with an appropriate name if one does not exist. 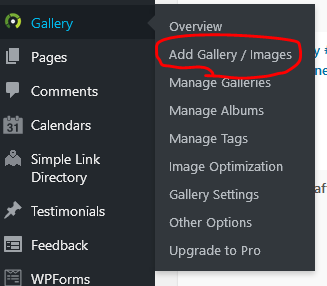 Select Add Gallery/Images in the left hand menu. 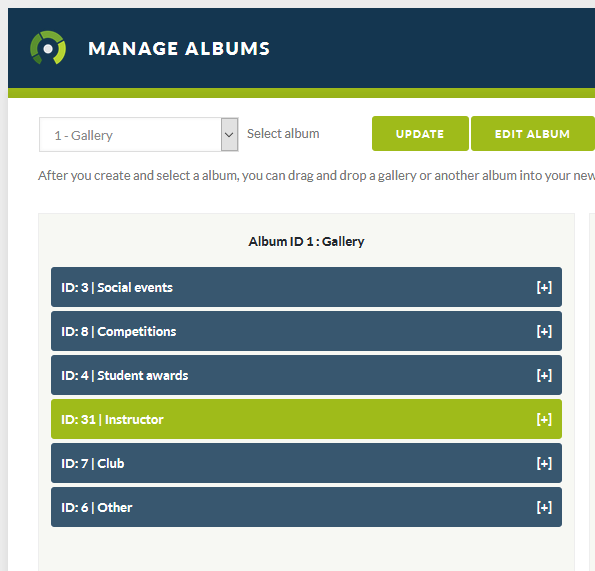 Now that you’ve got some new galleries, select Manage albums (1) in the left hand menu. Then select the album you want to add the galleries to – the Select album‘ drop down (2). Then use the Select gallery list (3) to drag the galleries to the album selected. The Select galleries list will show all galleries not currently in an album. There’s one top level album – called Gallery (it has ID 1). It contains the other albums based which are based around common themes (competitions, socials, etc.). Don’t forget to click the Update button to save changes. The order of the albums and galleries in the Album lists is the order that they appear on the website. Where appropriate (e.g. competitions), we keep them chronological, most recent at the top.